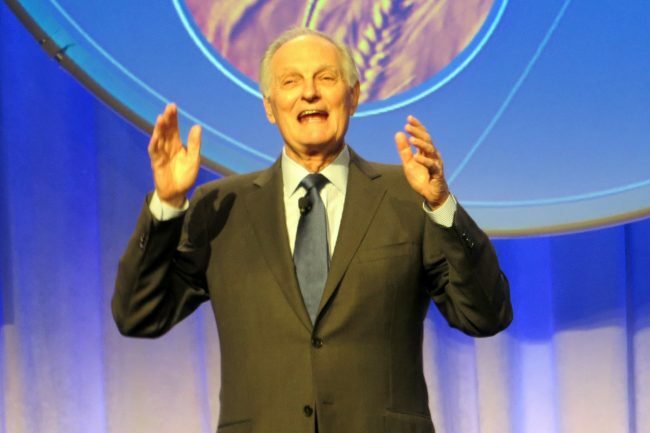 82-year-old Alan Alda who is best known for playing Hawkeye Pierce on CBS’s series “M*A*S*H” for 11 years, was diagnosed with Parkinson’s disease almost four years ago. He publicly discussed how he was dealing with his illness on Jan. 17, 2019. In an interview with People Magazine, Alda discussed how he was diagnosed. In 2015, Alda’s wife of 61 years, Arlene, noticed his arms were not moving when he was walking. He also started to act out his dreams as he slept. Both are symptoms are early signs of Parkinson’s. Alda openly admits that he was scared when he first heard the prognosis, and he revealed it to the public in July 2018. Once diagnosed he started to learn everything he could about the disease. The actor discussed how he started a new exercise program which includes boxing, tai chi and listening to John Philip Sousa while marching. Alda appeared on “CBS This Morning” and said that his life remains full since being diagnosed, and Alzheimer’s does not slow him down. He continues to act, works at the Alda Center for Communication Science at Stoneybrook and has given lectures. He believes somebody will do a movie of the week about the sad turn his life has taken, but he does not feel that way. He says the thing he is most thankful for is to have his wife, three daughters, and eight grandchildren to help him get through this. He said he is still deeply in love with his wife even after all these years. People Magazine asked him what else would he like to do. He said that he had not made any plans for the future. He likes to improvise in his life. He likes to tackle what is in front of him. On Jan. 27, Alda will be receiving the Lifetime Achievement Award from SAG (Screen Actor’s Guild.) Tom Hanks will be presenting him the award. Parkinson’s afflicts one million Americans. It is a nervous system disorder that causes dopamine levels to drop. Parkinson’s often starts out as hand tremors. Other common symptoms are stiffness, loss of balance, slur words, lose the sense of smell and develop slow movement. It is incurable, and symptoms worsen over time. Medication can help with the symptoms. Other celebrities who have the disease are Michael J. Fox, former president George H.W. Bush, and Linda Ronstadt. The cause of Parkinson’s is unknown. Only 10-15 percent of Parkinson’s cases are known to be heredity. Other risk factors are exposure to toxins, age, and gender. The Parkinson’s Foundation reports men are more likely to be diagnosed with the disease than women. One Response to "Alan Alda Discusses His Parkinson’s Diagnosis and His Secret to Life"